-In bars 20-24 wherever you've written a Cm chord I'm just hearing it as an open C-G with no Eb. 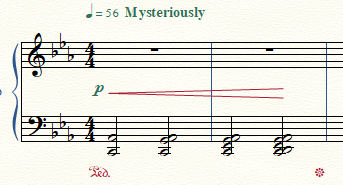 -For the first two bars, might I suggest something like this instead? This way we add in exactly one note at a time (which matches the original better in my opinion) and also removing the slurs means we keep the dissonance up throughout the entire thing as on piano we don't have the luxury of constant volume sustaining. -You're a bit too close to the copyright on the first page. You could move one system to the second page if you like or just redistribute the first page so the bottom of the last system stays above the copyright. -Kind of picky but the diminuendo in bar 24 should really end on the last note rather than halfway through it. I think that should be everything, nice stuff. I have the pedal there to help sustain the notes, but I actually like your alternative better. Updated. Nothing is too picky! Updated. Other than that this looks great now. Whoops, thought I fixed that. Updated. This submission has been accepted by Latios212.